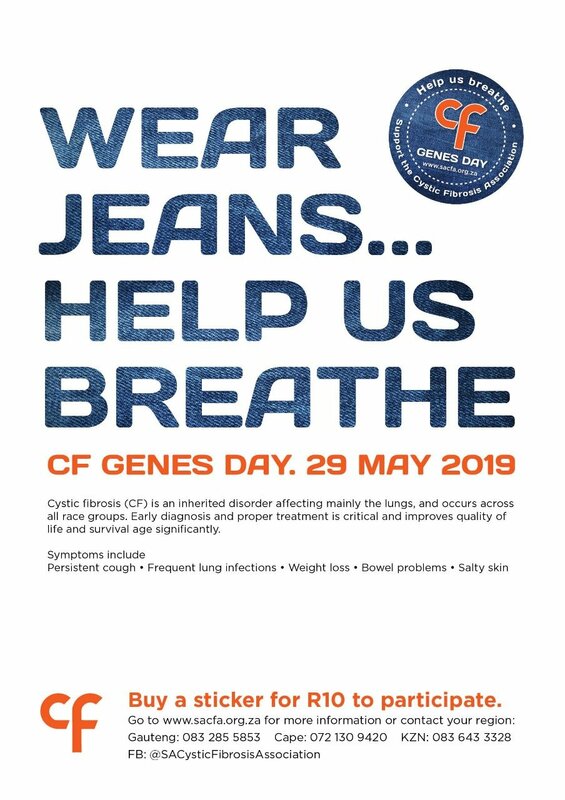 CF Genes Day is coming up on 29 May 2019, so let’s make an early start so that schools and companies book this event and participate. Let’s create a lot of awareness and raise funds at the same time. In order to take part each person needs to have a sticker and wear jeans. Groups,schools and companies may purchase stickers from any one of the distribution points given below. If you are outside the main centres, please contact Alan on 083 285 5853 to arrange for stickers to be mailed to you. CF Genes Day is a campaign by SACFA, so donations or money for stickers should be deposited into the appropriate region association bank account – please refer to regional pages for banking details. Only stickers issued by SACFA are valid. No printing of stickers is permitted.